Would you like to refresh or further your teaching skills? 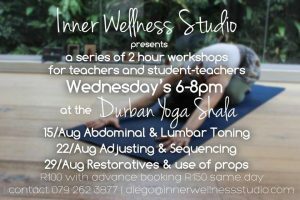 Inner Wellness Studio is dedicating the next 3 Wednesday’s of August to refining our teaching practice by sharing our understanding with other teachers. If this sounds like something for you or a friend let us know! Btw, these workshops qualify for Continued Education hours with Yoga Alliance.